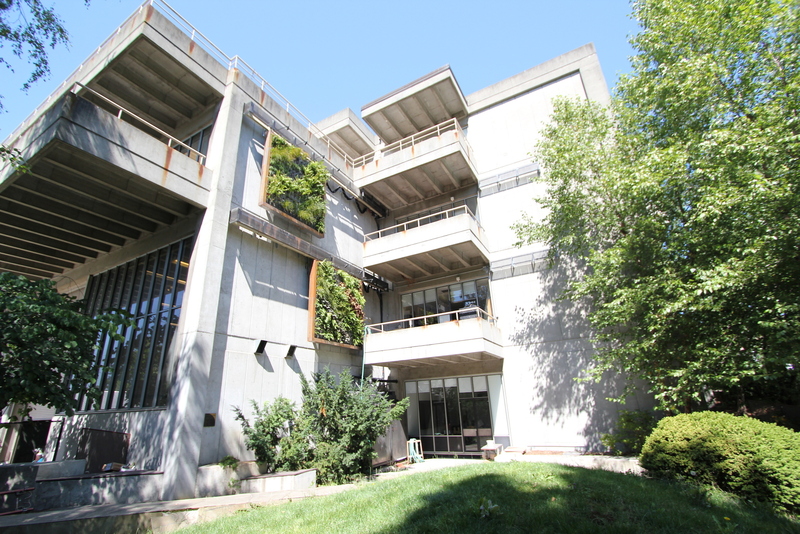 Designed and spearheaded by the UW Green Futures Lab (GFL), the UW Biodiversity Green Wall, Edible Green Screen, and Water Harvesting System was completed in the fall of 2012. Located in the southeast corner of Gould Hall on 15th Avenue and NE 40th Street, the award-winning project has been widely publicized and has the potential to provide numerous benefits such as reducing building energy needs, mitigating heat island effects, conserving potable water, reducing stormwater pollution, and increasing urban biodiversity. However, in order to both maximize these benefits and replicate them in future projects, they must be monitored, measured, and analyzed. Initial monitoring of the project in 2012 piloted research protocols to assess the 10’x10’ living panels’ capacity to cool exterior and interior temperatures, support bird and insect use, and contribute plant diversity to the urban environment. This initial monitoring also estimated the potable water savings and stormwater flow reduction from the water harvesting system that captures and stores Gould Hall roof water to irrigate the green wall. This proposal aims to refine and implement these monitoring methods over a longer research period to build from the intellectual and financial capital already invested in this pioneering project and to fully maximize its impact. contribute to UW’s reputation for innovating and espousing sustainable practices. Reducing heating and cooling needs for buildings. By acting as a heat sink during the day and a heat source at night, green walls reduce building energy demands. The EPA estimates the buildings account for 36% of total energy use and 30% of greenhouse gas emissions in the United States. Reducing polluted stormwater runoff. Water harvesting systems divert rainwater from building roofs that would otherwise either go to a water treatment facility or carry pollutants directly into water bodies. Conserving potable water. By relying on rainwater inputs, the water harvesting system significantly reduces the need to irrigate the green wall with potable water. Irrigation currently accounts for the majority of potable water usage in the United States. Enhancing urban biodiversity. The green wall provides important habitat and foraging opportunities for birds and insects. This project was funded during the 2013-2014 academic year.